While the United States has a great sporting culture, most of it circles around Basketball, Baseball and American Football. Soccer (Football for the rest of the world) has not really caught on with as much popularity. Although the U.S. Women’s Soccer team is arguably the best in the world, the men’s team is anything but. Why has the sport failed to catch on? What can be done to make the sport more appealing to future generations? Despite playing in every FIFA World Cup between 1990 and 2014 and even hosting the 1994 World Cup, the United States men’s national team failed to qualify for the 2018 World Cup after being humbled 2-1 by Trinidad and Tobago in October 2017. However, along with Mexico and Canada, the United States managed to win the hosting rights for the 2026 FIFA World Cup earlier this year. Discussions surrounding the lack of a soccer culture in the United States have come to the fore once again, as many followers are worried that the country is doing very little to cultivate grassroots support. The prominence of homegrown sports such as American Football, Basketball and Baseball has made it difficult for soccer to penetrate into the hearts of the American public. It has struggled to make inroads into its traditional working-class and immigrant bases, as wealthy, suburban dwellers tend to control access to the sport. While the women’s team has been among the most dominant teams in the world with 3 world cups under its belt and a strong talent pool to scout from, the men’s national team has consistently failed to do well. Why has this happened? And what can be done to develop public interest in the sport? Although the men’s team has struggled to make a major impact, things weren’t all gloom and doom for them in the early 20th century. 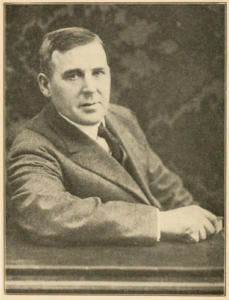 Thomas Cahill, the founder of the United States Football Association (USFA), convened a meeting at New York City in 1921 to set up a professional league for the soccer teams in the country. The eight-team American Soccer League (ASL) was soon founded and saw matches that attracted over 10,000 spectators per game, numbers that were only rivalled by baseball, America’s national pastime. The ASL benefited heavily from the arrival of many new European immigrants as they brought with them the rich sporting culture from their native continent. Many of the teams were sponsored by industrial giants from the region now referred to as the Rust Belt, with teams such as Bethlehem Steel even making exhibition tours to Europe. The league had become strong enough to attract British talent with hefty wages, although FIFA threatened the USFA with expulsion in 1927 as many of these players were already under contract. However, the United States sent a team to Uruguay for the inaugural World Cup in 1930 where the ASL’s superstars took the nation to a 3rd place finish, which remains the USA’s best ever performance almost a century later. Despite the success of the ASL, political, economic and organizational rivalries were making a visible impact on the fortunes of American soccer. The Johnson-Reed Act of 1924 severely curtailed the influx of European immigrants to America, thereby cutting off the sport’s largest fanbase. The American working-class was slowly waning and many workers couldn’t afford tickets in the coming years. The USFA soon locked horns with the ASL as it required its teams to play in the annual National Challenge Cup. Apart from 3 of the league’s teams, everyone else refused to play citing the huge travelling expenses. The ASL soon lost its FIFA recognition as the USFA founded its own outlaw league. Even though both sides came to a compromise in October 1929, the stock market crashed 2 weeks later, and soccer became far less of a priority for the sport’s stakeholders. The Great Depression forced many teams to fold and in 1933, the ASL itself was forced to shut down. The United States’ brief, but the successful golden age of soccer had come to an unfortunate end. 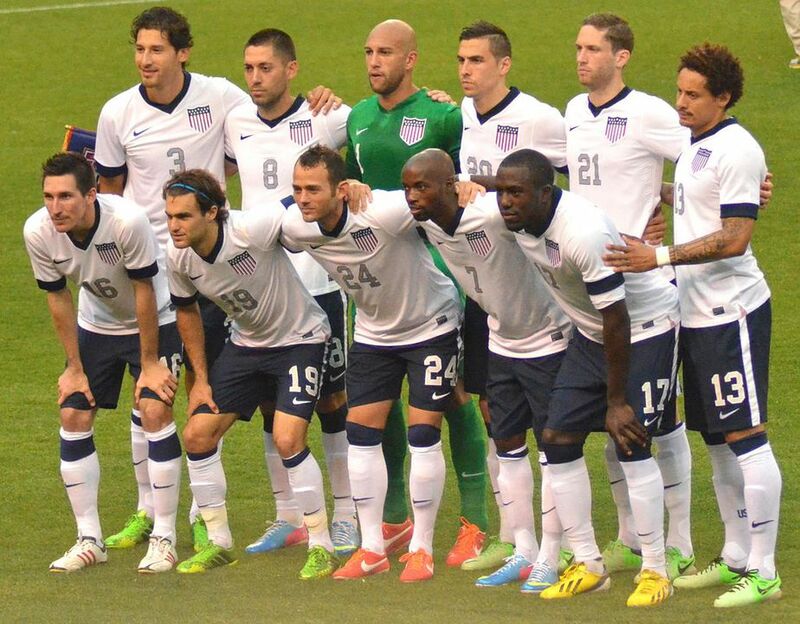 How can the US rebuild its soccer culture? Perhaps the greatest demon that soccer in America has to deal with is the issue of diversity and representation, as the sport has struggled to tap into the working classes and minorities across the country. Soccer across the world has traditionally found its largest base among the underprivileged and underrepresented while being dominated by rich, white suburbanites in the USA. It is unlikely that soccer will achieve the same levels of popularity among the working classes as union membership has steadily declined since the 1960s, while European trade unions have remained strong over the same period. This problem of diversity remains the hardest challenge for the sport in America. Further, unlike Europe where professional club academies train youngsters for free, US soccer academies are concentrated in suburban areas where they charge great sums of money for training. Latino Americans, soccer’s most ardent followers in the USA, find it hard to break into the professional levels of the sport as they don’t always have the money to participate in America’s pay-to-play system. Similarly, many of America’s inner-city inhabitants are excluded from the sport as they don’t have the access to soccer that suburban white families do. With many teams looking to turn a profit out of soccer, they’re not ready to invest heavily in grassroots development. However, teams such as the Philadelphia Union of the MLS are changing this trend by launching their own youth academies that will train many talented youngsters for free; mimicking the famed youth academies of Europe. Although the history of men’s soccer has seen a lot of ups and downs, women’s soccer in the US has always been on an upward trajectory. The women’s team has won 3 out of the 7 world cups played so far and has remained one of the most dominant teams in the world during the last 3 decades. The popularity of the women’s game grew significantly in the US after Title IX laws banning discrimination on the basis of gender were enacted during the 1970s. 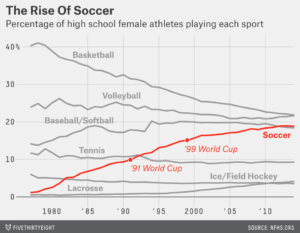 The number of women athletes playing soccer at the high-school level has grown by almost 20% between then and now, making it the third most popular sport for women in the USA, after basketball and volleyball. The US does significantly better than every other nation in the world in women’s soccer on the basis of the number of participants; more than 50% of all American youth players are FIFA-registered. Germany, the only other country with a similarly high female talent pool for football, sees a far greater number of adult FIFA registered players with 69%, while this figure is only 6% in America. The difference in numbers shows that the professional soccer culture in Germany is far greater than in America and encourages more women to take up the game. While the US is already a force to be reckoned with in women’s soccer, a shift in mindset could produce even better results in the future for the national team. Despite lacking a strong soccer culture, the country is blessed with large stadiums all across the country that are unlikely to have a large number of empty seats when the tournament comes around in 8 years. Major League Soccer attendance numbers are at its highest ever at the moment, making it the 7th most popular soccer league in the world, ranking ahead of the French Ligue 1 and the Dutch Eredivisie. The numbers look promising for the MLS and strongly attest to the rising popularity of the sport in the nation. Still, men’s soccer still lies far behind American football, basketball and baseball when it comes to being a part of the national sporting identity of the United States. Men’s soccer needs to take a leaf out of the women’s playbook and make a stronger effort to spread the game at the high school level and not just at a pay-for-play level. Expanding the game has to be a priority for US Soccer’s top executives over the next 8 years, as the country will look to really make its mark when playing the World Cup in its own backyard.